금강반야바라밀경은 줄여서 ‘금강경’이라고 부르기도 하는데, 조계종의 근본경전으로 우리나라에서는 반야심경 다음으로 많이 읽히는 불교 경전이다. 이 책은 고려 우왕 13년(1387)에 진원군 유구(柳구)와 진천군 강인부가 왕비에게 도움을 청하여 간행하였다. 닥종이에 찍은 목판본으로 한 권의 책으로 엮었는데, 크기는 세로 25.2㎝, 가로 15㎝이다. 이색(李穡)이 책이 만들어지게 된 경위를 간략하게 적은 글을 짓고, 각지(角之)가 글씨를 썼다. 그후 산인(山人) 지담(志淡)이 이를 다시 찍어냈는데, 풍양군부인 조씨와 정자회가 함께 참여하였다. 검푸른 색 표지에 제목은 금색 글씨로 썼고『법망경 ·금강반야바라밀경합본』(보물 제919호)과 같은 판본으로 전체적으로 인쇄나 보존상태가 양호하다. Popularly known as the Diamond Sutra, Vajracchedika prajnaparamita Sutra is a canonical scripture of the Jogye Order of Korean Buddhism and is the second most read sutra in Korea, after Maha prajnaparamita hridaya Sutra (Heart Sutra). 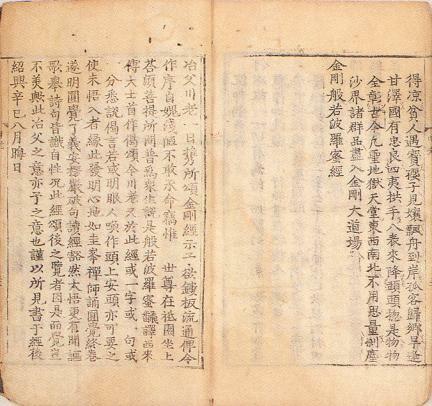 This book was published by Yu Gu and Kang In-bu with the support of the queen in 1387 (13th year of the reign of King U of the Goryeo Dynasty). 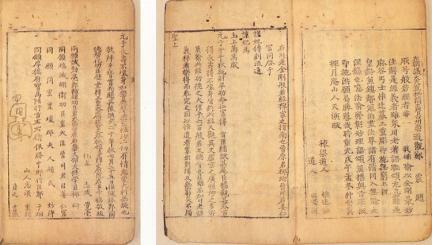 Printed on mulberry paper using woodblocks, this book measures 15 cm wide and 25.2 cm long. Yi Saek wrote a simple note explaining the printing procession, with Gakji transcribing the characters. 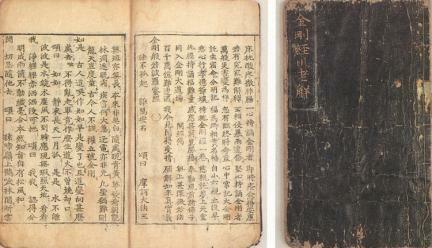 Later, Jidam reprinted the book with the participation of Lady Jo (Lord Pungyang’s wife) and Jeong Ja-hoe. The title is written on the dark-blue cover in gold color. It is identical to the Brahmajala Sutra (Sutra of Brahma’s Net) and Prajnaparamita Sutra (Diamond Sutra), which are collectively designated as Treasure No. 919. As a whole, it has been preserved in good condition.